Tags: Decorating, DIY Home, DIY Projects, Home and Decor, Knock It Off! DIY Projects, Knock It Off! Dollhouses are darling, but they can cost a pretty penny, especially when you consider kids grow out of them in just a few years. 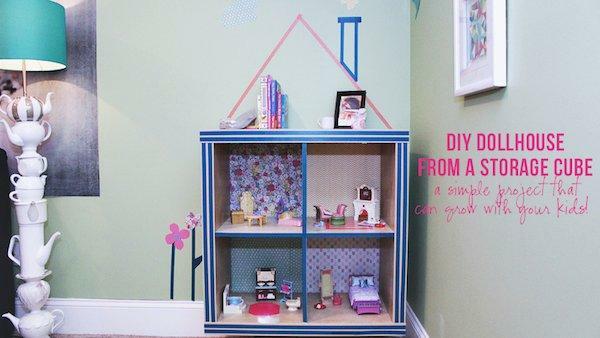 Here's how to make your own from a big-box store shelving unit that's easy, cheap and can be used for storage when they're done playing with it! 1. Assemble the cube unit per the included instructions. Raise the unit above the baseboard molding and mark where you want the brackets to go. We hung ours in the center of each cube, making sure to hit a stud. Don't worry, these will get covered later! You could always keep the unit on the floor, but we liked the idea of raising it to make it easier to play in the bottom cubes and because we wanted to add a step, just like stairs leading into a real house! 2. Screw the brackets both into the wall and into cube unit. Now it's time to have some fun! 3. Use the washi tape to create a roof line, chimney and windows on the side. These don't have to be perfect. In fact, we wanted imperfect because we were going for a whimsical, childlike design! You can also accent the grid in between the cubes for additional color. 4. Spray the back side of the scrapbook paper with low-tac spray adhesive and attach it to the wall behind each cube. Our pieces of paper were 12x12 and didn't quite fill the space, so we used a straight-edge to cut another piece so that it fit perfectly. Line up the seams. 5. Dress up the cubes with mini furniture and accessories. We added a few rugs made from washi tape, too! That's all you need to turn a boring cube unit into a playful area for your kids to imagine anything they want! When they've outgrown the dollhouse, lower the cube unit, remove the washi tape and scrapbook paper and use it as storage or a bookshelf. Simple and reusable!